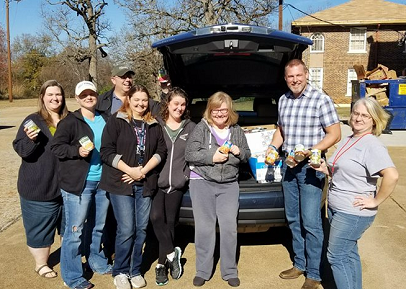 Pentecom closed out 2017 by participating in an internal canned food drive. Our Palestine office was split into four teams, and each team competed to see how many items could be donated. A grand total of 188 canned food items and 13 other items for a total of 201 items were donated by Pentecom staff. Our conversion team won our friendly competition with a total of 71 donations! The winning team (pictured below) traveled to Hope Station, a local non-profit organization in Palestine that serves as a rehabilitation for the poor and homeless, to deliver Pentecom’s contribution. One of the aspects that makes our company so unique is that our headquarters is located in a small-town atmosphere. After such a wonderful year, it is Pentecom’s privilege to be able to “give back” to our local community.